If you have spent much time in shows displaying your photography or art prints you may have had the occasional customer pick one up and damage it. If you are new to participating in shows, here I provide some basic tips on protecting your work. Over time your canvas will become less tight and seem looser on the mounting frame. This is perfectly normal and fortunately since we use a poly-cotton blend the canvas will not become as loose as it would otherwise if we were using an all cotton canvas. Fortunately there is a simply fix. If you have spent much time at an art supply store’s framing section you will see that a number of frame sizes exist but they seem to be limited. How important is a photos focus in relation to resolution. This looks at a recent scenario where the focus of the images or lack thereof became the issue when the images were made into large canvas prints. Buying a camera can almost be as intimidating as purchasing a computer these days. The good news is that you really do not need a bunch of special features to get good results. In fact, visiting a camera store is an excellent way to start. Many of the sales people are familiar with the features which each camera offers. Another thing to consider is that many times you will be stuck with features you do not need, simply because that is how cameras are made. Extra margins in your image file can give you great control of the border size you want with a print however if you did not intend to include margins but did, it can give the impression your image was not printed at the correct size. Believe it or not. Many people don’t think about these factors when purchasing a frame for a canvas or fine art print. To be frank, most drive-by frame purchases are based on the style of the frame as opposed to the environment in which the frame will be displayed or whether the frame accents the print. Here we look at some of the advantages to inkjet technology when it comes to photo prints. Many photographers are starting to move this direction and rightly so. This does not mean lab prints on Kodak papers are going to be phased out but it does imply how inkjet is taking over the photo printing industry. After careful evaluation and customer feedback we how we added some new ways to ship paper prints. 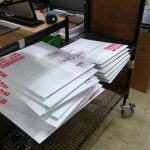 Starting early in 2011 we began to offer the ability to have your giclee paper prints shipped flat with the exception of very large prints. A common question arises when people are trying to order about image cropping and why this happens. The reason this can happen is because the original file being submitted does not match the same aspect as the size being ordered for print. The result is a a crop to fit method which is the common default standard in the art and photo printing world.